Originally posted in 2013. Read the series so far. How the Christian allocates his financial resources should reflect the reality of his position and calling. Paul calls this “walk[ing] worthy of the calling with which you were called” (Ephesians 4:1). The disciplines discussed in this series are not distinctively Christian disciplines. Indeed financially astute unbelievers will annually check their credit report, know their FICO score, eschew bad debt, and track their income and expenses. Another value of a budget is that it settles issues and ‘drives a stake in the ground’. It communicates that these priorities have been set and agreed upon. Last year we had a raccoon in our attic, the resolution of which is much more expensive than one might think. It involved animal control setting and monitoring traps; a tree surgeon hired to remove trees near the house (the ingress to the roof area); and repairs to the soffit and fascia. This year a major storm damaged 4 large trees in our yard and blew over a large spruce. Because I am handicapped, the chain sawing is in my past. We had 7 men working 7 hours in our yard cleaning up the storm debris. Afterwards we had to have the spruce stump ground out and a new tree planted in its place. Our emergency fund paid for these expenses. While one cannot budget for the unusual or the disasters, one can budget to save for emergencies. College students. The budget will focus on the big question,”How will I pay for college?” and the littler questions about clothing, cell phone, entertainment, books and travel. Newlyweds. The major issues will be rent, clothing, and setting priorities. Couples starting a family. The major issues will be adjusting to a one-income household or child-care expenses. Couples with teenagers. Anecdotally this is the age where children really seem to be expensive. A major issue will be budgeting for the insurance for extra drivers. One cannot budget unless they have a record on their income and expenses. Bless my 93-year old mother. She was a bookkeeper for much of her life. Now long retired and in a retirement home, she maintains one large-format (9” x 12”) green ledger page for each month and records all of her income and expenses by hand. I simply could not live with a manual process like that to track income and expenses. One could use Quicken (Intuit) or another money management program. We use the web-based service Yodlee to track income and expenses. Intuit has a similar product called Mint. 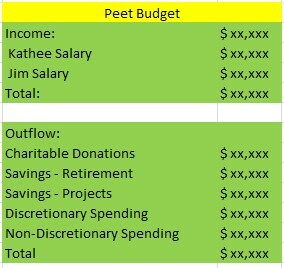 For those who prefer a more manual process but wish to avoid the green-ledger approach, Microsoft Excel has a template to track income and expenses. To budget one looks back at the history of income and expenses and projects income and spending for a future period. It may take a quiet afternoon of work to accomplish this task. Quicken and Yodlee both have a budgeting component. In our practice (this may be helpful), expenses fall into two categories: discretionary and non-discretionary. Examples of non-discretionary (for us) are: our parking contract in downtown Minneapolis, utilities, and groceries. We do not line-item budget for the non-discretionary. Examples of discretionary expenses that we budget for would be clothing, anticipated travel, and projects for the house. We have a plan to give; we have a plan to save (“pay yourself second”) and a plan to spend. For each of the above we had an actionable plan to save so that each would be pre-paid. We want to host a nice party for my son who is due to return from Afghanistan approximately June of 2014. I’ve already scouted out a location—Yarusso’s in Saint Paul. For each of these, we have an actionable savings plan. Our checkbook balance on any given day matches the balance on our cash-flow budgeting sheet in Excel. Our cash-flow budget looks ahead to the end of the year. It looks back to the beginning of the month. When I balance the checkbook, I delete the previous month’s data. Kathee and I have a “financial date” once a week on Tuesday. We review the previous week’s expenses. We look ahead to the next week’s projected outflow. We share screens on our PC’s and log onto our checkbook, our brokerage account (retirement), our savings account, and our checking account. Christians are to “abound” in giving (2 Cor. 8:9). I don’t believe that a newborn Christian will automatically be a good giver. Christians need to be instructed and grow into this grace. Years ago when I was a new Christian someone wisely advised me to give 10%, save 10% and spend 80%. I see wisdom in this advice. And yet I do not believe that the New Testament teaches tithing. I subscribe to John MacArthur’s view of tithing. The excerpt below is from the “God’s Plan for Giving” tape series. Because Israel was a theocracy, the Levitical priests acted as the civil government. So the Levite’s tithe (Leviticus 27:30-33) was a precursor to today’s income tax, as was a second annual tithe required by God to fund a national festival (Deuteronomy 14:22-29). Smaller taxes were also imposed on the people by the law (Leviticus 19:9-10; Exodus 23:10-11). So the total giving required of the Israelites was not 10 percent, but well over 20 percent. All that money was used to operate the nation. New Testament believers are never commanded to tithe. Matthew 22:15-22 and Romans 13:1-7 tell us about the only required giving in the church age, which is the paying of taxes to the government. Interestingly enough, we in America presently pay between 20 and 30 percent of our income to the government—a figure very similar to the requirement under the theocracy of Israel. I believe every Christian should give. And I believe that every Christian should faithfully support his local church. Ideally one will plan to give and plan to give generously that the Church would prosper financially.